Pharmaceutical companies, suppliers, contract manufacturers, and other companies across the pharma landscape must have change control systems in place to ensure that any changes in processes or production do not compromise the safety, quality, purity, and potency of pharmaceutical products and biologics. Different types of changes occur across the business, and any change that affects product quality or safety must be controlled and managed, including changes to processes, equipment, documents, materials, packaging, and others. Today, many organizations track and manage change in isolated point solutions that only manage certain types of changes at certain locations. For example, two different manufacturing plants may be managing equipment changes in separate, local systems – and perhaps in a completely separate system from document changes. Managing change in an isolated manner may allow organizations to meet basic industry guidance and requirements; however, a disconnected and isolated change management system can lead to several challenges and risks, including limited visibility, operational inefficiency, difficulty assessing risk, and disruption to production. A better practice is to manage change in a global system that encompasses all types of changes across all company locations. The most effective automated global change management systems electronically and securely manage all information in a centralized, scalable, and reliable system, eliminating the potential loss of information and increasing visibility. The change control process can be standardized for both local and global changes, streamlining deployment efforts and increasing user adoption. Managing all change control items in a centralized and harmonized manner enables companies to eliminate redundant systems, decrease production costs, and reduce corporate liability and patient risk. Change control is interwoven with multiple elements of an enterprise quality management system (EQMS), including deviation management, audits, registration tracking, CAPA, and training management. Best-in-class EQMS can accommodate global change management as a fully integrated element of quality management, enabling full lifecycle management and seamless integration to other quality processes across different business areas, including manufacturing and regulatory affairs. 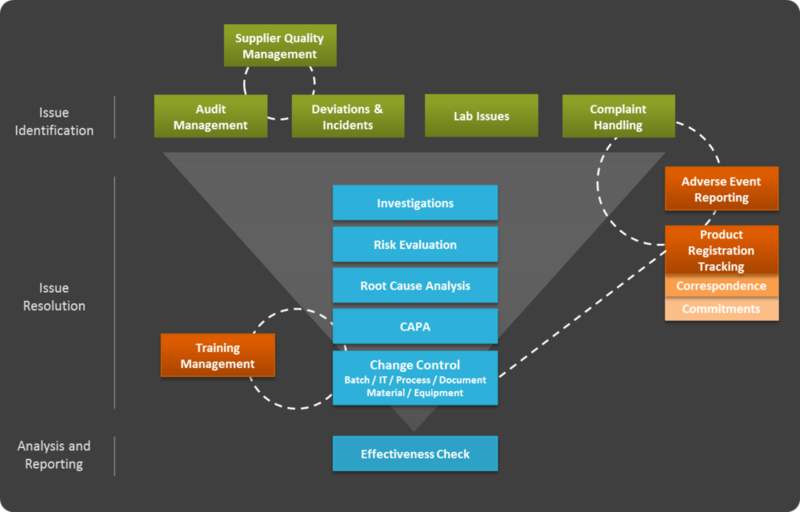 EQMS provides traceability through functionality that links change control and CAPA records. Data centralization provides clear visibility to all levels of the organization by enabling more effective trending, reporting, and dashboarding. And the benefits of managing change within the EQMS reach far beyond the realm of quality management – companies will realize improved cycle time and time-to-market, enhanced product quality, and the flexibility to adapt to changing regulations.